Marvel Studios’ latest cinematic superhero is already on the big screen, but that’s not stopping Walt Disney Pictures from delivering another brief Ant-Man spot. If you’ve been concerned about the prevalence of Ant-Man spoilers in trailers lately, fear not. This one’s a bit different and not only does it not contain any spoilers whatsoever, it actually doesn’t contain any footage from Ant-Man, either! It does, however, feature stars Paul Rudd and Michael Douglas and, very quickly, things get weird. Check it out in the player below! If you missed them throughout the week, check out our exclusive video interviews with Corey Stoll (who plays the film’s villain, Darren Cross), Peyton Reed (who directed the film), David Dastmalchian and Michael Peña (Kurt and Luis), Evangeline Lilly (Hope Van Dyne) and Rudd himself. 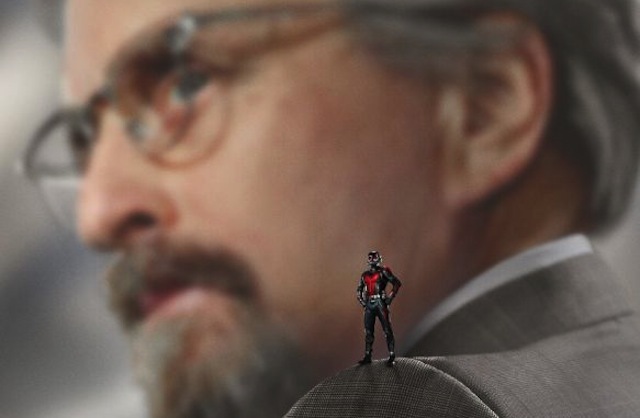 Ant-Man brings a founding member of The Avengers to the big screen for the first time. Armed with the astonishing ability to shrink in scale but increase in strength, master thief Scott Lang (Rudd) must embrace his inner-hero and help his mentor, Dr. Hank Pym (Douglas), protect the secret behind his spectacular Ant-Man suit from a new generation of towering threats. Against seemingly insurmountable obstacles, Pym and Lang must plan and pull off a heist that will save the world. The Ant-Man cast also features Bobby Cannavale, Tip “T.I.” Harris, Wood Harris and Judy Greer. If you’ve already seen it, be sure and let us know what you think. Want to know more about Ant-Man before you see the new film? After you check out the interview, be sure to take a look at our recent round of Marvel movie news and Ant-Man related features such our spotlights on Ant-Man’s costumes, Ant-Man’s villains and Ant-Man’s superhero partner/wife/ex-wife, the winsome Wasp! Paul Rudd & Michael Douglas lead the ant charge! See Marvel’s Ant-Man in theaters today!